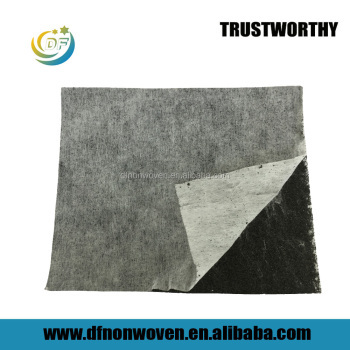 Due to the thinness and good ventilative feature ,activated carbon nonwoven cloth is mainly made into activated carbon mask, which has excellent effect on deodorization and gas defense for serious polluted industrial waste gas. Made of nonwoven cloth with base material of natural fiber, chemical fiber or compounded fibre, and activated carbon, Not only has the characteristics of cloth ,such as strength, flexility, durability, but also has the characteristics of activated carbon---High adsorption and micro pore.It is used widely for air and water purification. Carbonized through special process, active carbon filter materials are able to capture chemical fumes, tobacco smoke and bad smells in the air. They are the most efficient absorbing media available at present.